Effective rebuilding of the mighty salmon runs of the Columbia River depends on science to guide our actions, a firm commitment to implement those actions, people and funding to do the job, and a robust monitoring program to guide us through the uncertainties of the future. After years of controversy, federal, state and tribal governments and the people of the Columbia Basin are making great strides in carrying out a plan that reflects these principles. We can embrace the accomplishments to date, remain committed to future progress and address the remaining uncertainties with vigorous and transparent science. It is time to put the long-running litigation and posturing behind us and give ourselves and the salmon the opportunity to succeed. The science supports it, and the fish deserve it. When I first joined the Obama administration as the new head of the National Oceanic and Atmospheric Administration, controversies over the salmon plan for the Columbia Basin were raging. Familiar litigants were battling over well-worn disagreements about how to operate the river's dams, whether the overall improvements were enough, and how to address the unavoidable uncertainties, including the impacts of a changing climate. All fair questions. The parties were in their fourth round of litigation spanning close to two decades, with no resolution in sight. Some urged us to rubber stamp the then-current version of the program, and others urged us to toss it out altogether. Instead, we asked Federal District Judge James Redden to allow us to pause and convene a group of highly respected independent scientists to examine the scientific foundations of the program with fresh eyes and give us their frank advice. After several months of work the scientists concluded that the core program is scientifically solid. They advised our team to include additional provisions to address the inevitable uncertainties that exist. The scientists called the report a "great scientific analysis" and said "one could not have done better." One said, "These results were for me an affirmation of the good work of the many scientists and managers who have dedicated decades to the effort, but also of the need to improve the adaptive management contemplated by the program." We took the scientists' advice and strengthened the program significantly. We beefed up the monitoring program to track key indicator watersheds. We're tracking how the fish are doing and are committed to contingency measures if their numbers decrease unexpectedly. In addition, we're reporting regularly on implementation progress and have backed up the commitments with enforceable deadlines and the money to make them happen. These significant modifications, in turn, responded directly to the earlier guidance from Judge Redden to ensure that the commitments were both real and reliable -- good advice in an uncertain world. The initial results of our adjustments to the program are now in. How are things going? Numerous indicators are demonstrating significant improvements. Most directly, the survival of juvenile salmon migrating to the sea is significantly improved, year by year -- reflecting the success of years of top-notch efforts to improve fish passage through the large dams on the Columbia system. The numbers tell the story, and they are persuasive. For instance, with a new passage system at Little Goose Dam, 99.4 percent of yearling chinook, 99.8 percent of steelhead and 95.2 percent of sub-yearling chinook pass the dam safely. Similar systems are now in place at all federal Snake and Columbia River dams. This past year, we saw very high juvenile passage survival through the entire system -- and in a low-water year no less. Adult returns are also doing better. Some runs are returning at better-than-average rates, and other runs -- sockeye and steelhead -- are hitting numbers not seen since the dams were constructed. A wide array of improvements in the river and stream habitats that serve as essential spawning and rearing grounds for the runs are having significant impact, ranging from screening of irrigation diversions to improving in-stream flows to restoring the stream-side vegetation "buffers" that are vital for shade and other functions. These improvements are the product of a unique coalition of tribal governments, states, county officials and private parties, creating hundreds of jobs to rebuild a lasting healthy landscape. Most importantly, salmon are responding. The next steps are now up to the court. This spring, the parties expect Judge Redden to rule on the disputed issues. There are, indeed, continuing disputes about the program we put in place. I understand and welcome this. As a practicing marine scientist, I fully embrace and applaud legitimate debate, which is a vital part of the scientific process. We have sought to ensure that these remaining issues stay front and center in our continuing evaluations as we work to improve the health of the system. They are best addressed by the scientific monitoring and evaluation that are and will be occurring as we work hard to implement the program. That is where these issues belong, and where they will be best addressed. We owe it to the fish and the communities that depend upon them. Let us continue this good, hard work together. 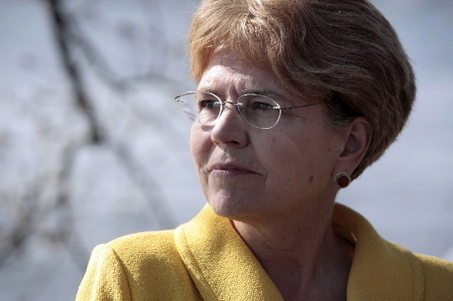 Jane Lubchenco is administrator of the National Oceanic and Atmospheric Administration and under secretary of commerce for oceans and atmosphere. She is on leave from Oregon State University, where she has been an environmental scientist and marine ecologist.